At First 5 San Francisco we know that a working parents’ ability to provide breastmilk for their baby has a positive public health impact. 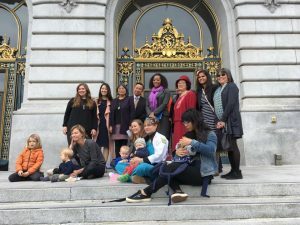 This past Wednesday Supervisor Katy Tang’s office encouraged a Nurse-in on the steps of City Hall in recognition of legislation introduced at the Board of Supervisors to strengthen lactation accommodation for working parents in San Francisco. The legislation requires lactation spaces to be clean and safe, have a seat, a surface to place a pump, and access nearby to a sink and fridge. It also requires employers to notify new employees about their lactation rights as a part of the hiring process. New construction will also be required to include lactation spaces. It can be hard for parents to return to work and continue to provide breast milk, so this legislation will reduce barriers in the workplace so parents have a choice to continue providing breast milk. Breastfeeding legislation increases the incidence and duration of breastfeeding, as seen by higher breast feeding rates in California since the introduction of state lactation laws. Breastfeeding is not just a lifestyle choice, but a significant health choice for mother and baby. Educating people about this can do much to promote breastfeeding, and to promote healthy lifestyle choices. “This policy is meant to ensure women are supported when returning to the workplace because for many women, it is not a choice to work when they are living in a city as expensive as San Francisco. [Employees will want to return to work when they feel supported by their employer. ]” Said Supervisor Tang. Improving workplace breastfeeding support will help to ease the transition of parents who return to work following the birth of a child; ensure women who are pregnant or considering pregnancy know that breastfeeding will be accommodated by their employer; provide a motivating, employee-supportive work environment for all employees; assist employees to experience work-life balance; help employers retain talented employees; and help employers control healthcare costs. Breastfeeding benefits everyone. Read more about the proposed ordinance, which was featured in the SF Chronicle where they also featured the Mamava lactation pod being used in City Hall!